The chart below shows an interesting global trend which has been occurring in the past few quarters. As you can see, bank stocks’ 12 month forward multiples are rising in Japan, America, the U.K., and Europe. American net interest margins are improving as the Fed is raising rates unlike the central banks from the countries below. This gives the American banks some momentum. That might be why American banks are outperforming. 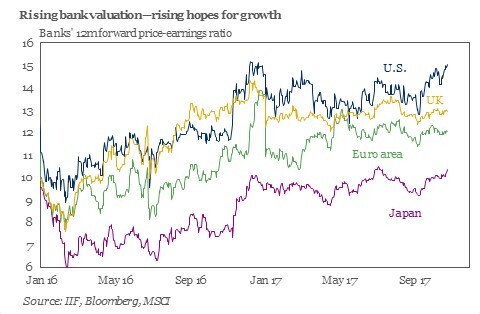 It’s true that the earnings estimates should cover this improvement, but trends are often underestimated by analysts in both directions. It’s why you saw companies in the energy market missing expectations in 2016 even as analysts lowered their projections to account for lower oil prices. Global growth has been accelerating which helps loan demand for banks in all these regions. The banks in America also might be outperforming because of the possibility of tax reform and regulatory reform. The odds are diminished for tax reform, but both combined probably come close to 50% odds. One notable factor which isn’t included in these forward estimates is the decline in insurers’ earnings. That’s because there was never a point where the hurricanes hurt 12 month earnings expectations. No one knew there would be 2 major hurricanes hitting the U.S. 10 months ago when they were making full year forecasts. The financials are heavily represented in the small cap indexes, so these loses make their current multiples look artificially high. Keep that in mind when bears show the Russell 2000 current PE being inextricably high. The Chicago PMI was released on Tuesday. As you can see, the index hit a 6.5 year high. It was up from last month’s report of 65.2. Backlogs were the highest in 43 years. This is a result of the carryover effect from last month which had the highest backlogs in 29 years because of the hurricanes. This shows that even some of the October numbers were affected by the hurricanes. New orders hit the second highest level since May 2014. Production growth was the highest since August 2014. The employment index fell below 50 because of the shortage of skilled workers. Firms have started to lose workers to other firms which offer higher wages. 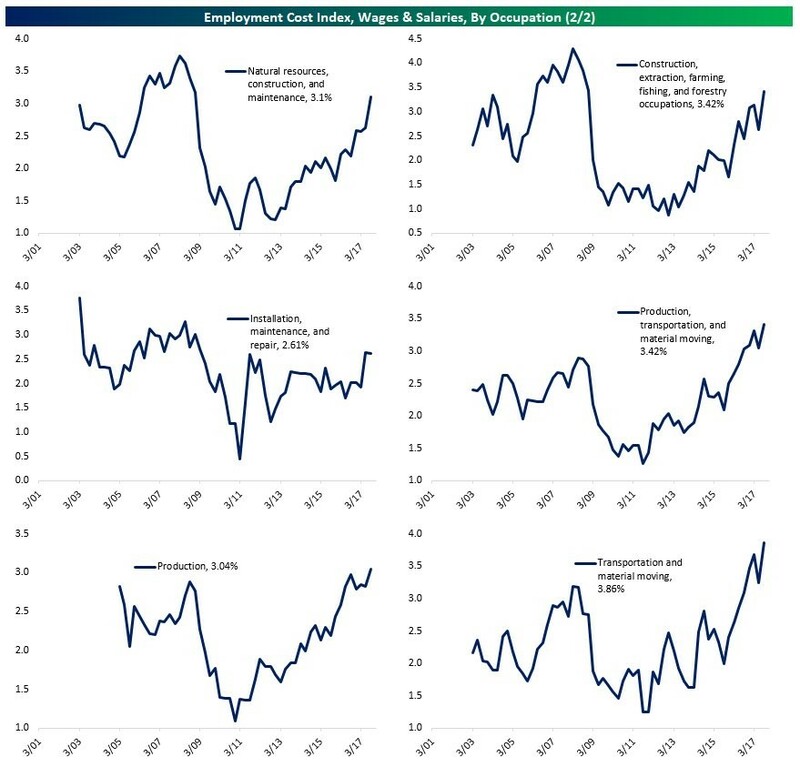 This a great indicator for wage growth. On the other hand, even with this increase in wages, the inflation pressures fell. This was catalyzed by the ending of some of the shortages which were caused by the hurricanes. The decline in inflation after the hurricanes, which I have discussed previously, could rear its ugly head in October’s CPI report. Other factors make me more optimistic on inflation in the medium term such as the M2 velocity of money. Besides the Chicago Fed PMI report, the ECRI report came out. It breaks down the wage changes among various industries. 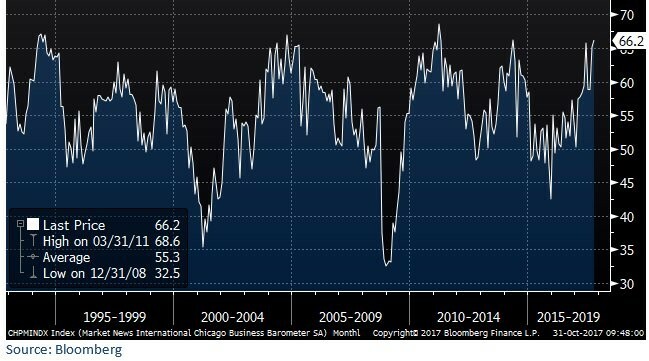 As you can see in the charts below, the wage growth in the production and construction industries are consistent with the statements made by firms in the Chicago PMI report. This is different from the Macrobond real weekly wage growth among non-supervisory workers chart I showed in a previous article. The reason for the difference between the average hourly earnings of private productive and non-supervisory employees report and the ECRI report is that the former is subject to composition effects, meaning changes in employment among industries can mess with the final data. The Atlanta Fed report, which shows growth only slightly off the late-2016 highs, and the ECRI report adjust for composition effects which reflect actual wage pressure which the employment share change can sometimes mask. The Macrobond chart is the average hourly earnings of private productive and non-supervisory employees number multiplied by the average weekly hours and deflated by CPI. That means it also has composition issues. Interestingly, the wage growth in the transportation and material moving occupation was the highest. The ECRI report shows white collar wage growth struggling more than blue color wage growth. This is consistent with many of the manufacturing reports from the Fed we’ve reviewed. As you can see from the chart below, the professional and related field only saw 1.89% growth in the employment cost index. The management, professional, and related saw 2.27% growth which was below the average which was 2.61%. 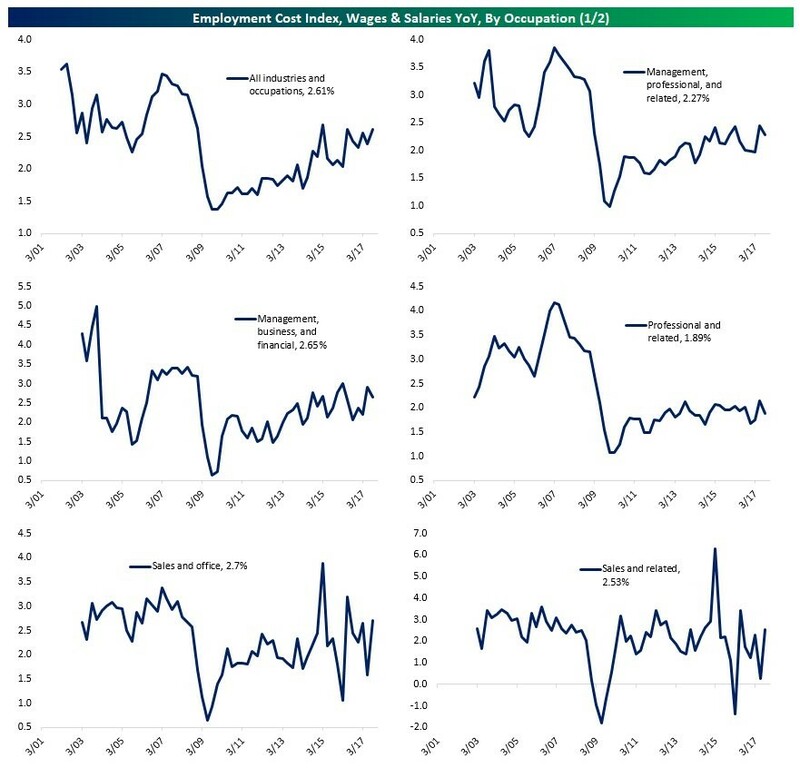 As you can see, most of the blue color jobs above are at or near the previous cycle peak, while most of the white color jobs are substantially below the previous cycle peak. I will show two charts which make opposing claims on valuations to give a balanced take on the matter. 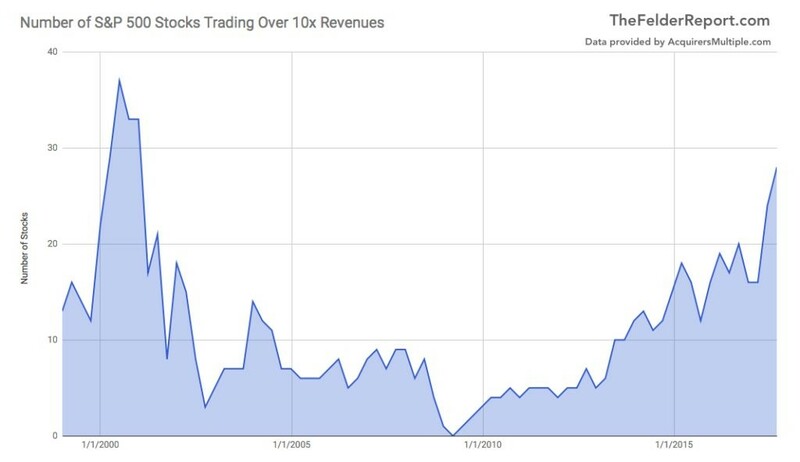 The chart below shows the number of S&P 500 firms which are trading over 10 times revenues. As you can see, there are nearly 30 stocks that reach that mark which is remarkable. The highest previous peak was in in the early 2000s when over 35 firms were that expensive. I have only anecdotal evidence of the amount of speculation in stocks by looking at Snap’s poor performance and Netflix, Amazon, and Tesla’s great performance. It’s better to see the visual below because it looks at every company. It’s disconcerting to have such speculation in this many names. On the bullish side, we have the table below which shows the returns for stocks with different CAPE ratios broken down between markets with positive momentum and ones with negative momentum. As you can see, the valuation matters as stocks generally have worse performance when the CAPE is high. However, the trend is your friend as there’s also a strong relationship between performance and momentum. Stocks always are up when the CAPE is up over the past year and stocks sometimes fall when the CAPE is down in the past year. Currently, we are in the bottom right point which I circled; the CAPE is rising and it is above 30. Out of the 10 possibilities, this point has the 7th best performance. 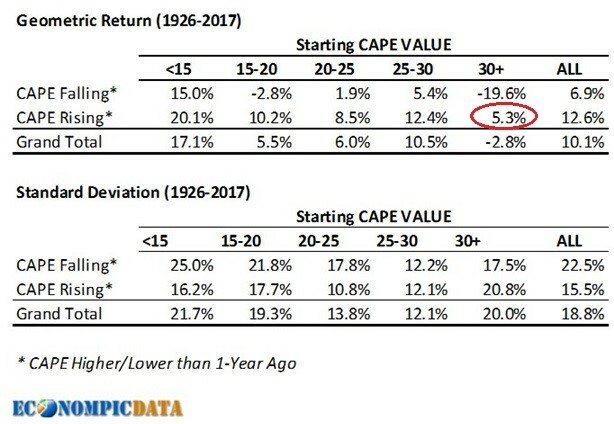 If the CAPE starts falling, stocks will be at the worst option. The conclusion is, while stocks are expensive, the market will have positive returns until the momentum fades.